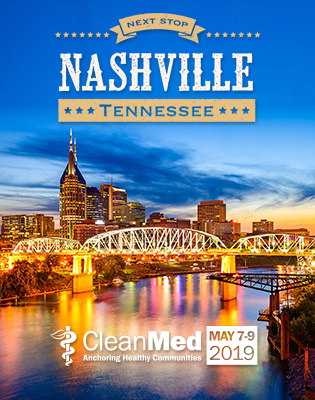 (Reston, Va.)— CleanMed, the nation’s premier conference on health care and sustainability, announced today that STERIS Corporation is the Host Sponsor for the CleanMed 2014 conference, scheduled to be held in Cleveland next spring. Last year, CleanMed drew a record 900 health care leaders to discuss best practices, learn from each other and preview innovative new technologies. CleanMed is convened and organized jointly each year by Practice Greenhealth and Health Care Without Harm. In addition to serving as the host sponsor for CleanMed 2014, STERIS has formally committed to ongoing environmental stewardship by joining Practice Greenhealth, the nation’s leading membership and networking organization for healthcare organizations that have made a commitment to sustainable, eco-friendly practices. STERIS is a leading global provider of advanced infection prevention, surgical, GI and perioperative workflow solutions. Last year’s CleanMed event included 55 educational sessions and workshops on health care’s most pressing sustainability issues, including: reducing toxics and chemicals of concern; sourcing and purchasing environmentally preferable medical products; providing sustainable, local food choices in hospitals; reducing energy and water use; and better waste management through recycling, reprocessing of medical instruments and smarter supply chain management. STERIS Corporation is a leading provider of infection prevention and surgical products and services for critical healthcare, pharmaceutical and research markets. Approximately 6,000 dedicated STERIS employees around the world work together to deliver a broad array of equipment, consumables and service solutions that enhance Customer productivity and quality. The Company is listed on the New York Stock Exchange under the symbol STE. For more information, visit www.steris.com. To learn more about STERIS Corporation’s environmental stewardship, please go to http://www.steris.com/about/stewardship/index.cfm. Practice Greenhealth (https://practicegreenhealth.org/) is the nation’s leading membership and networking organization for institutions in the healthcare community that have made a commitment to sustainable, eco-friendly practices. Members include hospitals, healthcare systems, businesses and other stakeholders engaged in the greening of healthcare to improve the health of patients, staff and the environment. CleanMed (http://www.cleanmed.org/) is the premier conference on environmental sustainability for the health care sector. The conference attracts leaders and key decision makers from across the industry, convening healthcare professionals, university researchers, designers of professional buildings, and vendors of cleaner and safer products and services. Its mission is to accelerate the healthcare sector’s commitment to environmental sustainability and regenerative health to improve the health of people and the environment.